If you've ever been to any Turkish or Lebanese restaurants, you've probably come across garlic sauce. I'm a huge fan of it, but I hadn't realised how simple it was to make until very recently. It may require a little patience but it is very, very easy, especially if you have a decent blender. The reason for making garlic sauce was as part of a shawarma sandwich. However, as I don't have a rotating grill, I've found a great compromise in baking the chicken double-wrapped in baking paper and foil. Put together the marinade by whisking all the ingredients together in a bowl. Then prepare the chicken by slicing the breast fillets horizontally across into 2-3 slices, and then tenderise. Also flatten and tenderise the thighs. Marinade the chicken breast and thighs together for up to 24 hours, then line a large square of tin foil with baking paper and alternate the breasts and thighs in a neat pile in the middle of the baking paper. Wrap the foil and baking paper parcel tightly then place it in a small bread tin if you have one to hand (otherwise, use a normal roasting tin or baking tray). Bake in the oven for 45 minutes at 180°C. While the chicken is roasting, prepare the garlic sauce. Crush the garlic into the blender (don't start running it yet). Once you've crushed all the garlic, add the salt and blend until the garlic turns into a paste. Drizzle the oil very slowly into the garlic, stopping pouring frequently to allow it to be absorbed by the garlic. Each time you stop pouring the oil, add a little lemon juice. Continue doing this until all the oil and lemon is absorbed. If you find the recipe too sour, add a little more olive oil. When the chicken is cooked, remove from the oven and let stand for about 5 minutes before unwrapping and slicing. While the chicken is standing, slice the tomatoes and lettuce and warm through the pitta. Unwrap the chicken parcel and thinly slice the chicken. 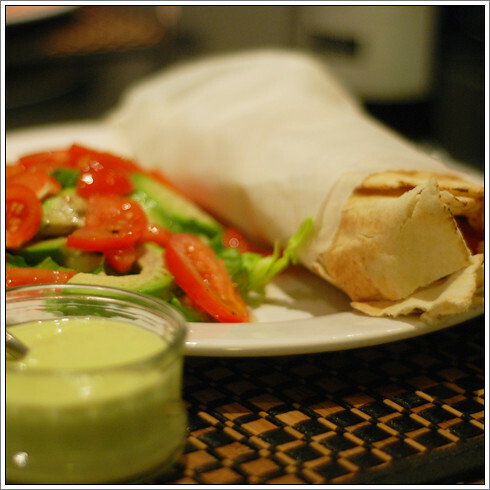 Arrange on the pitta, drizzle on a couple of teaspoons of garlic sauce and add a few slices of tomato and lettuce. Wrap much like you would a burrito and serve immediately. Delicious! The leftover garlic sauce is also very versatile - I found it made a very useful "lazy garlic" subsitute in sauces and is equally delicious stirred through pasta dishes with a grating of parmesan and a few shredded basil leaves!